You see that pre- and post-processors are almost the same. 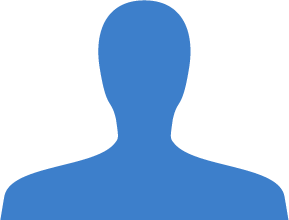 Their appointment is to prepare database for testing and to rollback unnecessary changes after testing is done. So, you can specify any SQL query for them to execute. 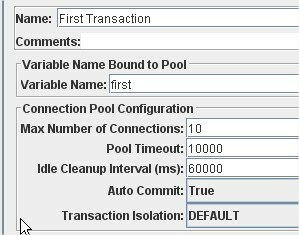 Another thing – “Transaction Isolation” option. And here I should say a few words about SQL transactions. A dirty read happens if a transaction is allowed to read data from a row that has been modified by another running transaction and not yet committed. See example in below. So, it’s very important for developer to choose appropriate isolation level for SQL queries. And that’s why performance testers need to take into consideration this parameter while developing test-plan. yOU can create SQL queries of any configurations. Let’s see, how it works. 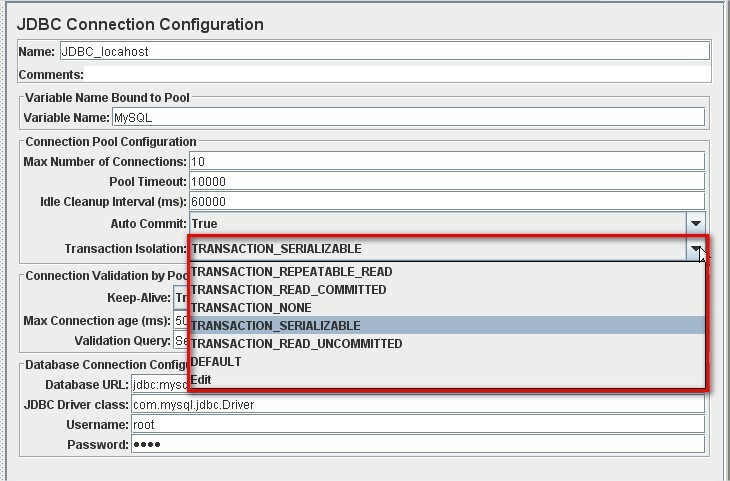 Then I create “Second Transaction” JDBC Connection Configuration. The only its difference from first transaction is that I set “TRANSACTION_SERIALIZABLE” as transaction isolation option (figure 6). 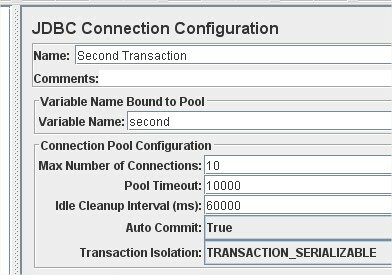 “Second Transaction” contains the same JDBC Request. 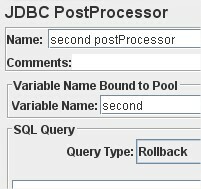 Both JDBC PostProcessors contain query “Rollback” to revert all changes in database to latest stable state(figure 7). 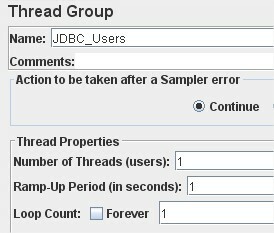 I’ll set only one user for “JDBC_Users” Thread group (see figure 8). OK, I press “Start” button. Test is executed and what I see in “View Results in Table” listener (figure 9)? Despite of the fact that connection 1 was created earlier, second request has less execution time. It happened because second transaction had SERIALIZABLE level and first only READ_UNCOMMITTED. So 2nd occupied database table until it ended and only after that first request could complete its job. So, you see that database performance depends on transaction isolation levels. 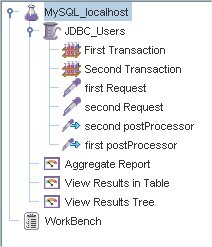 That’s why opportunity of selecting isolation level of JDBC request is important for database performance testing. Want to learn more? 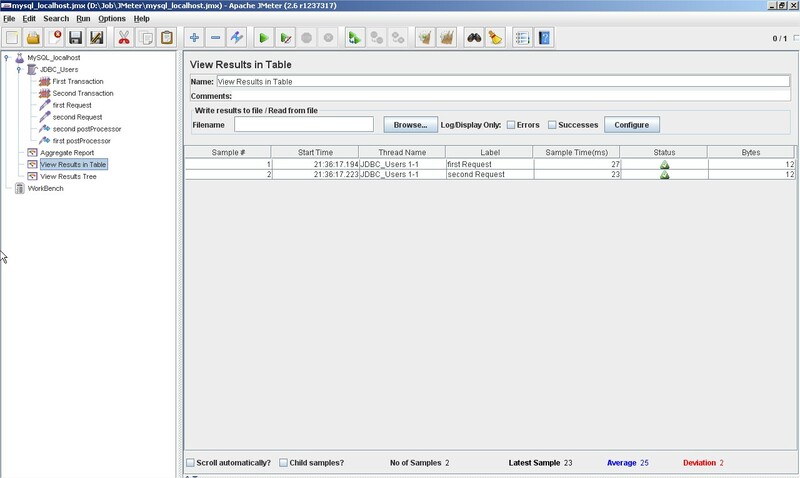 Read our blog post, Debugging JDBC Sampler Results in JMeter.